A new study on drivers of Congo Basin forest loss has been published in Science Advances. Researchers from the University of Maryland and the State University of New York concluded that small holder clearing continues to be the dominant driver of forest loss in the basin. This study, which was supported by CARPE, assessed forest disturbance dynamics for six Congo Basin countries (Cameroon, Central African Republic, Democratic Republic of the Congo, Equatorial Guinea, Gabon and Republic of the Congo) by using satellite data from 2000 to 2014 to examine 10,000 sample locations. The authors conclude that 84% of the forest disturbance area in the region is due to small-scale, non-mechanized forest clearing for agriculture. Sustainable forest management will be considerably challenged by increasing human population, particularly in the Democratic Republic of Congo where the correlation of population growth and increasing annual primary forest loss area indicate that all of the Democratic Republic of Congo’s primary forest could be cleared by 2100. 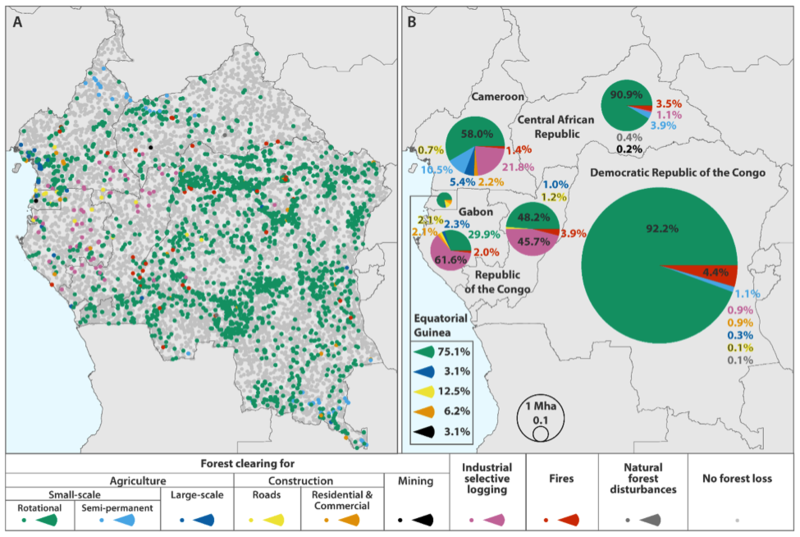 Congo Basin forest loss dominated by increasing smallholder clearing. 1 Department of Geographical Sciences, University of Maryland, College Park, MD 20740, USA. 2 College of Environmental Science and Forestry, State University of New York, Syracuse, NY 13210, USA.